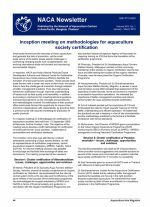 Inception meeting on methodologies for aquaculture society certification. Meetings discuss impacts, adaptation to climate change of Vietnamese shrimp farmers. 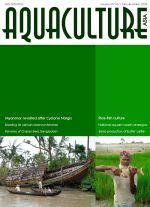 Aquaclimate project: India case study. In memory of Gagan Bahadur Nhuchhe Pradhan. Version 2 of the draft better management practices for catfish farming released. Technical course on federating digital library systems. GLOBALGAP standard in Thai shrimp farms: Mission (im)possible? The Victorian trout industry and the bushfires. Small-scale aquaculture in the Ayeyarwady Delta, Myanmar. 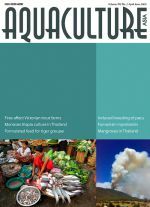 The history, status and future prospects of monosex tilapia culture in Thailand. Mangroves of Nakhon Si Thammaarat Province in Souther Thailand. Induced breeding of pacu Piaractus brachypomus in captivity. Fumosins - mycotoxins of increasing importance in fish. Microsatellite DNA markers, a fisheries perspective. Formulated feed for tiger grouper grow out. Myanmar revisited. Harvesting, traditional preservation and marketing of fishes of Chalan Beel, Bangladesh. Role of community in production and supply of larger, quality fingerlings. 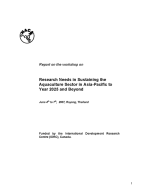 Can rice-fish farming provide food security in Bangladesh? 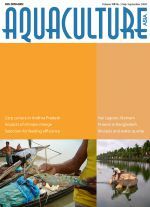 Nutritional and food security for rural poor through multi-commodity production from a lake of eastern Uttar Pradesh. Emerging boost in Sri Lankan reservoir fish production. Farming the freshwater prawn Macrobrachium malcolmnsonii. Breeding and seed production of catfish Ompok pabda. Possible improvements to carp culture in Andhra Pradesh. 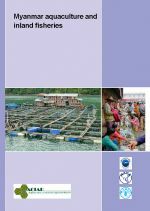 Aquaculture and environmental issues in the region of Nai Lagoon, Vietnam. Selection potential for feed efficiency in farmed salmonids. Freshwater prawn broodstock concern in Bangladhesh hatcheries. Production of Cirrhinus molitorella and Labeo chrysophekadion for culture-based fisheries in Lao PDR: Nursery and grow-out. Mussel farming: Alternate water monitoring practice. Use of poultry by-product meals in pelleted feed for humpback grouper Cromileptes altivelis. Aquaculture certification guidelines development process continues in Beijing, Washington D.C. Development of BMPs for catfish farming in Vietnam - survey of management practices. NACA extends cooperation with ADB for tsunami rehabilitation in Indonesia. International hands-on training programme on molecular biology techniques. Cage aquaculture carrying capacity tool now available. 6th Regional Grouper Hatchery Production Training Course completed. 2008 Forum on Fisheries Science and Technology, 25-27 September 2008, Shanghai, China. Aquaculture success stories 'write shop'. Bookshelf: New publications for free download. This workshop was the fifth in a series of consultations to prepare the international guidelines for aquaculture certification. The workshop had a strong emphasis on aquaculture products from China, and explored opportunities and challenges for implementing the certification guidelines in China towards improving overall aquatic production and trade of aquaculture products. 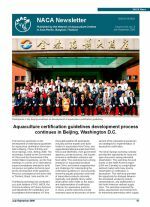 The workshop considered that international guidelines for aquaculture certification would provide a useful basis for development of standards for certification of aquaculture products in China. 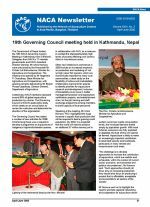 19th Governing Council meeting held in Kathmandu, Nepal. OIE/NACA Regional Workshop on Aquatic Animal Health. Vietnam catfish BMP project kicks off. Planning meeting, Regional Project on Reservoir Fisheries Development and Management. NACA to document 'Aquaculture Success Stories'. 6th Regional Grouper Hatchery Training Course 5-25 May 2008. Establishing a Working Party on Aquaculture Statistics. Implementing the ASEAN Roadmap for Integration of Fisheries Sector. London Expert Workshop on Aquaculture Certification. IDRC and NACA convened a workshop to identify the main research issues and needs to sustain Asian aquaculture into the first quarter of the 21st century, and also to bring them to the notice of relevant planners, managers and policy makers, and potential donors. The workshop was held in Rayong, Thailand from 4-7 June 2007. 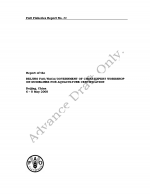 This report contains the issues papers drafted in preparation for the meeting and a summary of the discussions. Developing guidelines for sustainable freshwater aquaculture planning in Vietnam. Aquaculture production, certification and trade for small-scale farmers. Backyard hatcheries for crustaceans in Thailand. 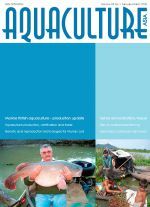 Alternative carp species for diversification in India. Genetic and reproduction technologies for aquaculture and fisheries management of Murray cod. Status of sahar domestication in Nepal. Comparative advantage analysis of shrimp production in Asia. Strategies to improve the livelihoods of the rural poor, Vietnam, and more.